Life with cataracts is like trying to see through a dirty window, eventually making even the most minor tasks impossible to perform. Cataract surgery replaces a clouded crystalline lens with a synthetic lens to restore clear, sharp vision. 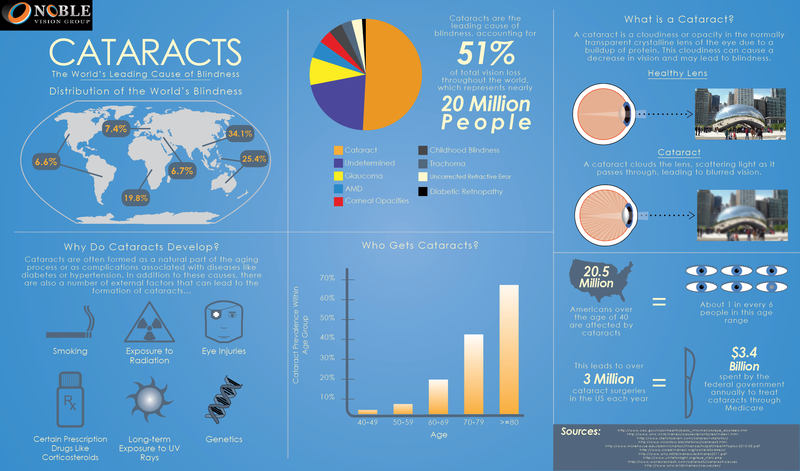 Why should I consider cataract surgery? The most apparent benefit of cataract surgery is the restoration of clear vision. After removing the clouded lens, your doctor will place an intraocular lens (IOL) that may even reduce your dependence on glasses or contacts. Cataract surgery allows you to resume all the tasks and activities that clouded vision had kept you from doing. Cataracts frequently cause sufferers to trip and fall over objects that they cannot see. Replacing the clouded lens decreases this risk. So how is cataract surgery performed? As with any surgery, patients should be in good general health. Severely clouded vision is interfering with your ability to be independent. Cataracts can often force you to rely on bright lights or other visual aids when none were necessary before. The thought of surgery can make any person hesitate, especially when it involves the eyes. However, this procedure is highly safe and effective. More than 3 million cataract surgery procedures are performed in the US each year and the majority of patients have their vision successfully restored. Furthermore, this surgery usually does not require sutures because the incisions are so small. During cataract surgery, your doctor will use a femtosecond laser, similar to those used in LASIK, and high-frequency ultrasound to break apart the clouded crystalline lens. Once the lens has been separated into small enough pieces, gentle suction is used to remove them through small incisions. The lens is then replaced with an IOL to restore vision. There are several different types of IOLs that can improve focus and, in some cases, reduce or eliminate the need for corrective eyewear. Depending on the type of IOL you receive, cataract surgery can significantly reduce your need for glasses. Many patients report that their vision is noticeably sharper. Details are much clearer and colors are noticeably brighter in the first few days after their procedure. During the first few days after surgery, your vision will be blurry. It is important to have someone drive you home from the office after the procedure. Your doctor may prescribe medicated eye drops or recommend wearing an eye patch or protective shield during this time to protect your eyes while they heal. Try to resist rubbing or pushing on your eyes, even if they are itchy. Doing so can increase your risk of infection. Your doctor will typically schedule several follow-up appointments: one about two days after your appointment, then a week after, then a month after. You should notice clearer vision within a few days, but it usually takes about eight weeks for your eyes to heal completely. If you need surgery for both eyes, your doctor will likely recommend treating one eye first, then the other after it has healed. This ensures that at least one eye is not compromised while you recover. Does newer technology make my procedure safer? Femtosecond lasers have improved several aspects of traditional cataract surgery. While some surgeons still use traditional techniques which rely on a scalpel, many now use an advanced femtosecond laser to create more precise incisions and break up the cataract for easier removal. In many cases, they can combine laser technology with 3-D imaging to make the treatment even more accurate. Cataract surgery is generally covered by both private medical insurance and Medicare. If you do not have insurance or Medicare, traditional cataract surgery will typically cost about $3,500. However, additions such as premium IOLs can raise the price of your procedure. Is there a way to estimate my final cost? Standard cataract surgery with a monofocal IOL is completely covered under many insurance plans, meaning you may have no out-of-pocket expenses. However, choosing a premium lens, such as a toric IOL for astigmatism, can add to your treatment cost. Laser cataract surgery can produce more accurate results and typically involves a shorter recovery time. Unfortunately, insurance does not always cover the use of advanced technologies such as a femtosecond laser. Many newer surgeons charge lower prices for their procedures. However, for most patients, trusting their vision to a more experienced and qualified surgeon is worth an additional cost. How do I know if I need a premium IOL? For many patients, a premium IOL can reduce or completely eliminate their dependency on corrective lenses, such as glasses and contacts. Your doctor can help you choose the right lens based on your current prescription, budget, and lifestyle. Can I really afford cataract surgery? *According to a study conducted by Market Scope, LLC. Why should I invest in more than standard surgery? Currently, there are no viable alternatives to surgery for advanced cataract sufferers who want clear vision. Some treatments, such as lanosterol eyedrops, have shown promise in animal studies but are still years away from being approved for use in humans. If you do not want to undergo surgery, your only options are to maintain your sight as much as possible through lifestyle changes and corrective eyewear. So what can I do to maintain my sight? If cataracts are compromising your independence and your quality of life, it's time to take action. Speak to your doctor today to find out if cataract surgery is right for you.